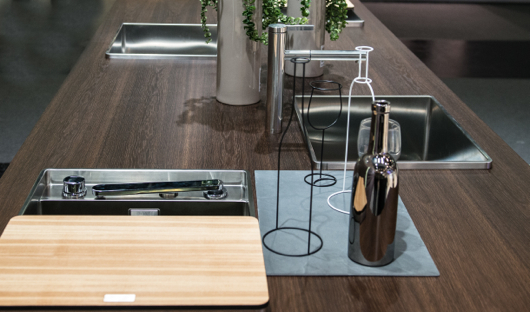 Just a few days ago, I returned from my trip to the fabulous Living Kitchen international kitchen show at IMM Cologne in Germany. 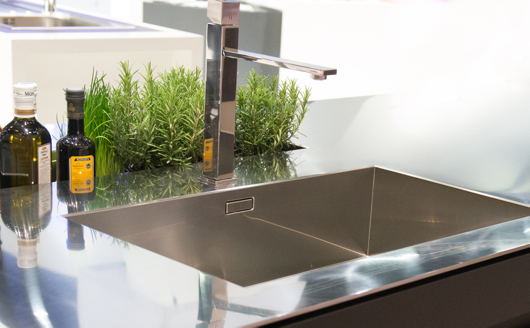 This was my second trip to the Living Kitchen show at the invitation of BLANCO. This time around I paid my own way (except for a few fabulous dinners with the BLANCO team) because I wanted additional flexibility in my schedule while there...not that there wasn't an ample amount of free time-I just wanted complete freedom...so of course, I ended up attending nearly every event! One section of BLANCO's dramatic booth! I am a member of the BLANCO Design Council, which is truly an honor, as I have the opportunity to contribute to shaping product design and strategy from time to time. BLANCO, while a global brand, has a corporate culture that in my experience with the company over a number of years, feels like a small, local, company (a good one!) The CEO, Achim Schreiber, greets, chats with and listens to anyone and everyone in a casual, friendly, way. I didn't realize who he was when I was chatting with him last week. I thought he might be a local BLANCO distributor or a regular, friendly, guy who had something to do with BLANCO till I found out later. He's relaxed, easy going, friendly and a great listener-a lovely man. All others connected to BLANCO-in Europe, Canada, US and elsewhere whom I've met over time, are also every bit as friendly and positive from my experience. I have to say, having an interest in "corporate culture", I often observe and try to figure out a company's vibe over time, by connecting the dots from different types of communications and other experiences. I'm convinced that the values of a corporate culture, as has been said before by others, travel from the top down on roads that are either positive, negative, fearful, confused, apathetic, passionate, good enough and so on. BLANCO's U.S. team, a truly great group of people, has a genuine dedication to, and belief in the brand that is remarkable, but let me also say, very well placed. 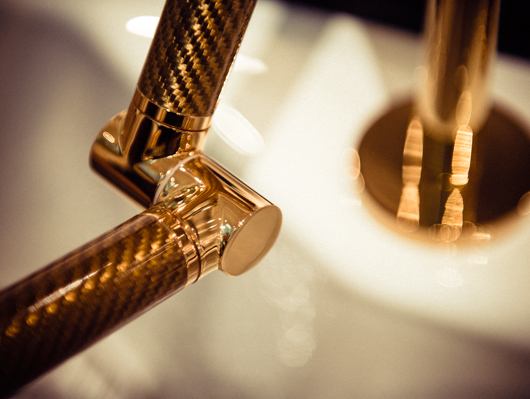 From my point of view, BLANCO, the corporation, takes the positive, socially intelligent, and passionate paths - from the top down - to create an absolutely superb range of products that has that desirable mix of precision engineering and beauty. 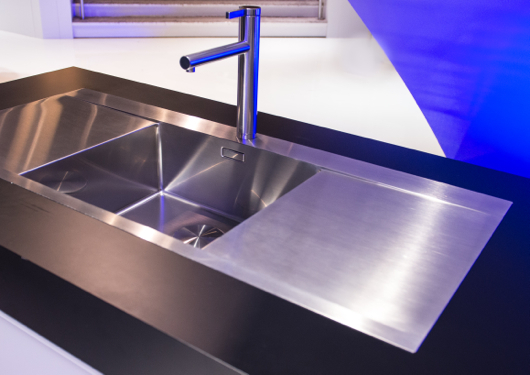 BLANCO's products are at once on trend and reflective of a classic modern design which renders them timeless. BLANCO does a whole lot of things right. They know their customer...very well. 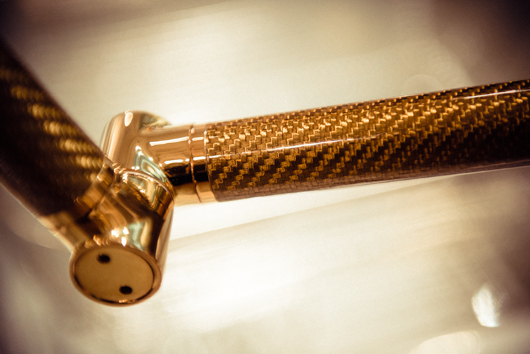 Ok, time to see some of the gorgeous products that I shot from the show floor. Some products are not available in the US, many are, but the point here is to help you experience that special mix of design and engineering. 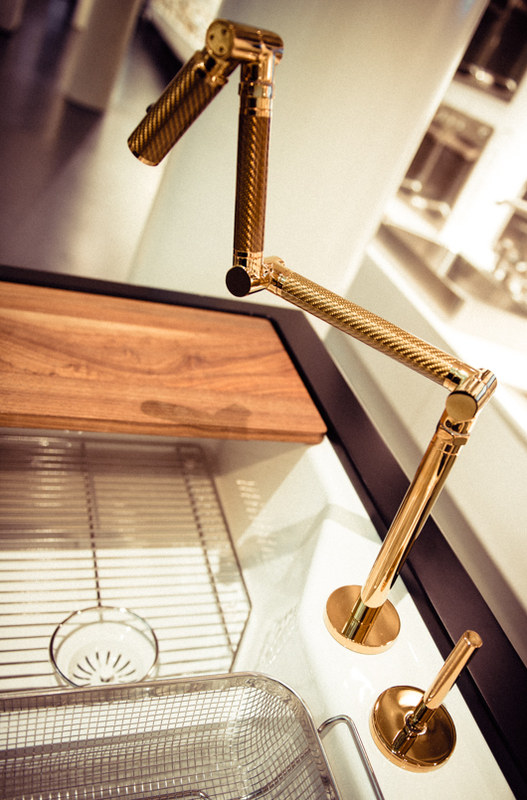 Take a look at swoon-worthy kitchen sinks and faucets! 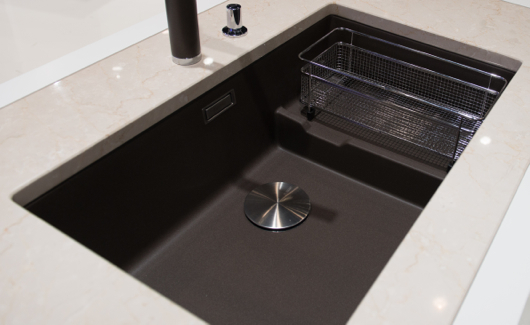 Above: Note the understated, elegant color, Truffle, the continuity of the flowing lines of the drainboard and the stainless steel rack, the simplicity of the drain cover, and the overall form of this top mount sink. 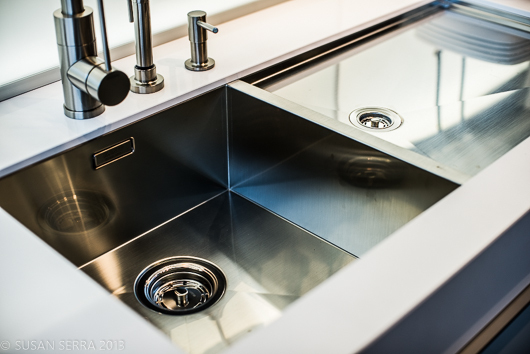 I hope you have enjoyed these shots and that they communicate BLANCO's dedication to quality and design! I had the opportunity to go to Kohler, Wisconsin in October, courtesy of Kohler, to attend the Kohler Food and Wine Festival, quite simply, a food and wine fantasy weekend escape! 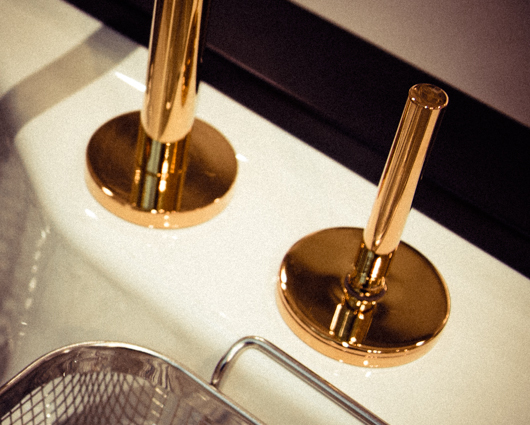 While there, I had so many wonderful experiences which I will share here and there, but as I casually went through my images today, I was struck by those I took of the Karbon faucet at the Kohler Design Center, here, in the Vibrant Moderne Brushed Gold finish. 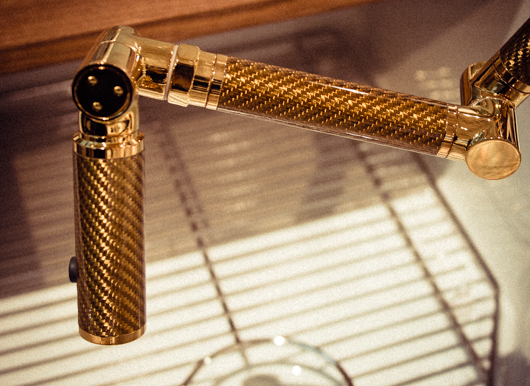 How gorgeous is this faucet? 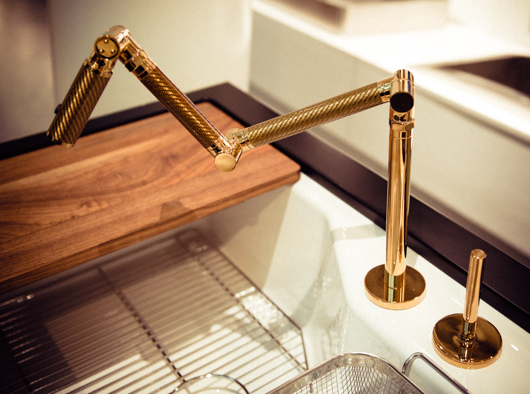 It's like owning a sculptural, or 3D, piece of art in the kitchen. It also comes in a wall mounted version. I thought I'd share some great products that I have discovered recently. It's something I should do more often because there are so many truly great products being introduced all year. I'll try to keep up the product info! 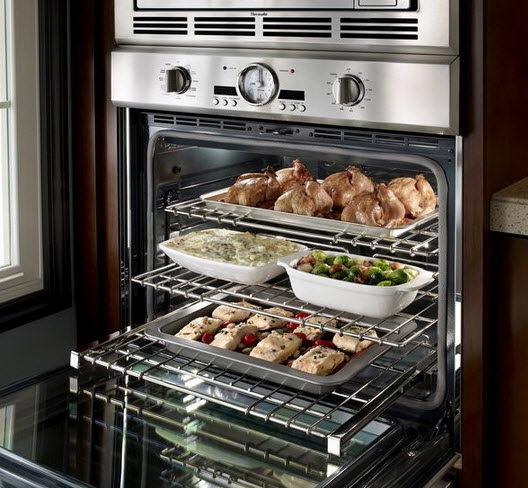 Thermador presents its 2012 line of built-in wall ovens. Who doesn't love to see the latest appliances?? You have the industry's only "softclose" door, the largest commercial style rotisserie with a 12 lb capacity (sign me up), a super large oven cavity at 4.7 cu. ft., the fastest preheat, a 2-hour self clean mode and a lot more! The design, as always, is VERY beautiful. Do you like the knobs? I do. 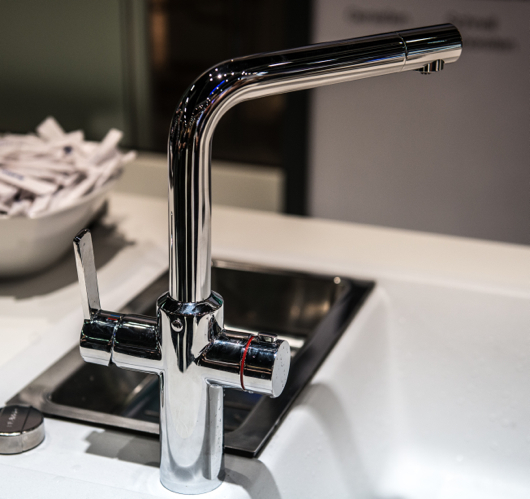 On the green front, it's well worth noting that BLANCO has recently introduced 9 new kitchen faucets that are focused on saving water in a significant way. 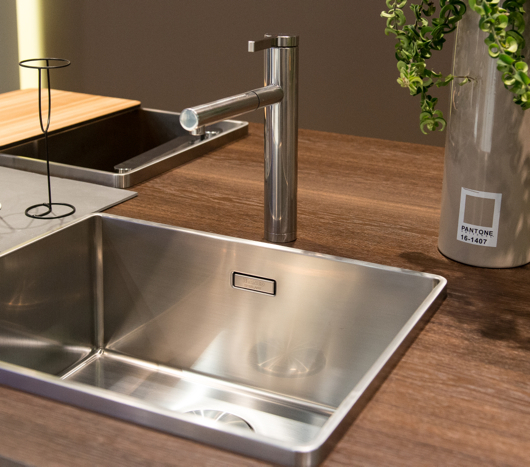 With a 20-30% reduction in water consumption, these faucets give you both style and real life energy savings. 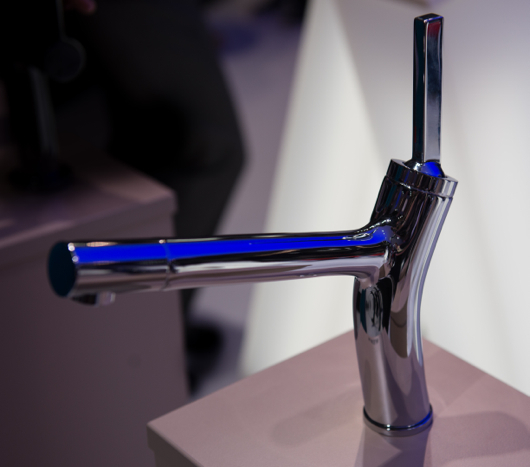 The HYDRA faucet is ultra efficient, conserving 30% water usage over conventional faucets. 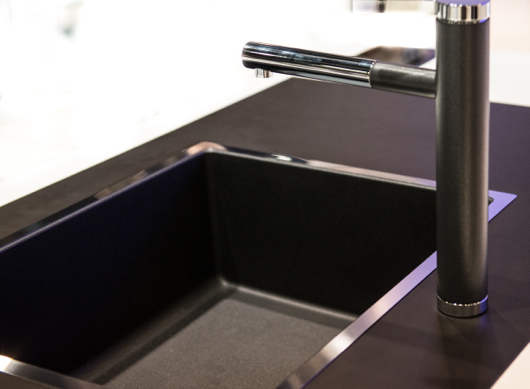 Another winner by BLANCO is their recently introduced Crystalline sink, available in both black and white. We want our kitchens open. At the same time, we have small kitchens. 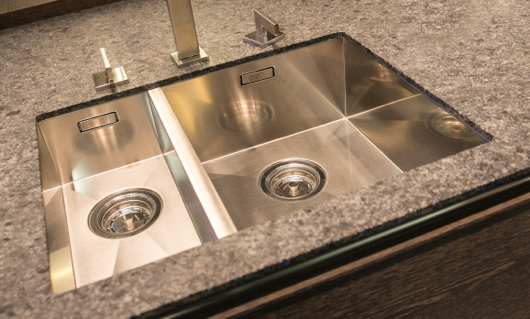 Now you can entertain in style with a "closed" sink, and during periods of prep, or entertaining for that matter, you have additional worktop space. This is not a small product feature. I think it's huge both due to its many functional properties as well as its fabulous looks. Keep things chilled, hide dirty dishes, work on it, put stuff on it, use it partway on, partway off for all sorts of functions. ThinkGlass is one of the most creative glass brands I know of. 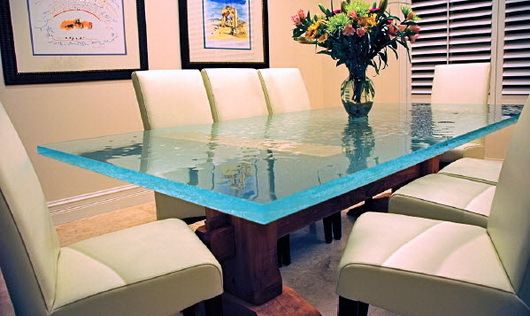 An eco-chic solution, ThinkGlass tabletops are made from 100% recyclable glass. I like the textured finish because of its highly durable properties - no staining and it hides smudges and scratches, unlike wood tables! Practical and stylish. Sub-Zero now has a French door refrigerator. Great for galley kitchens where you want full size/built in flexibility but cannot install a full width 36" door, here's the answer. Perfect for apartment dwellers or those who have a tricky refrigerator installation where a full width door would pose a problem. 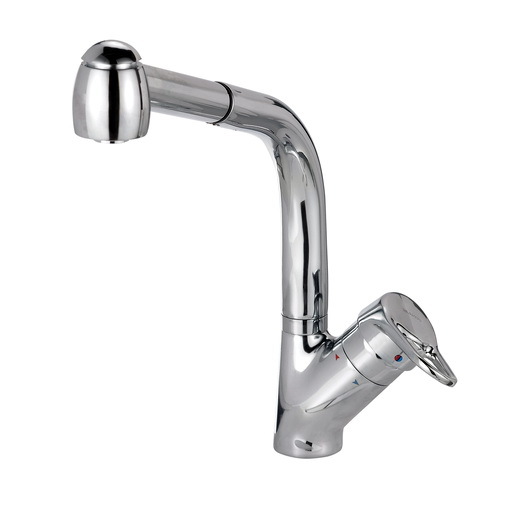 It's available in stainless steel with a choice of handles or as an overlay model. Some people think there are energy savings to opening one small door - depends on if you know where things are located in the refrigerator, but that could also be good, green, thinking. Lots more cool products to show you, coming soon! I'm sitting at the gate waiting for a flight delayed quite a few hours. 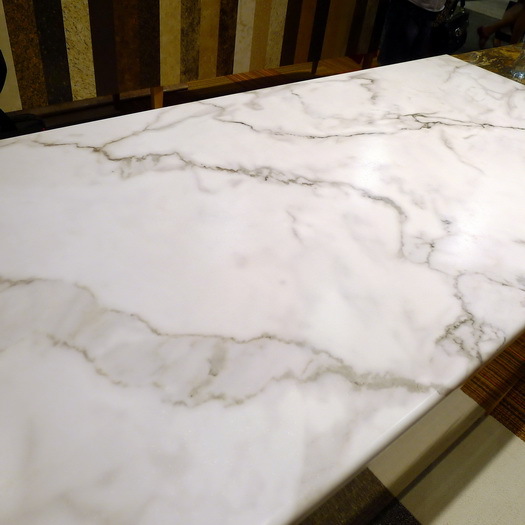 Let's take a look at random, decorative details in no order, seen at KBIS, for no reason other than I have time for a free form "gorgeous" fix. 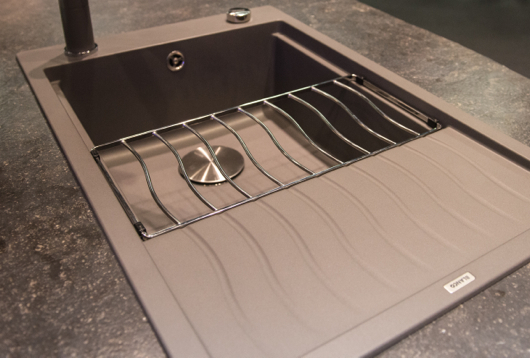 Already, pre show, I can share a few choice sneak peeks of products that will debut at KBIS. Here we go! New Ravenna Mosaics promises to have stunning new collections of tile! 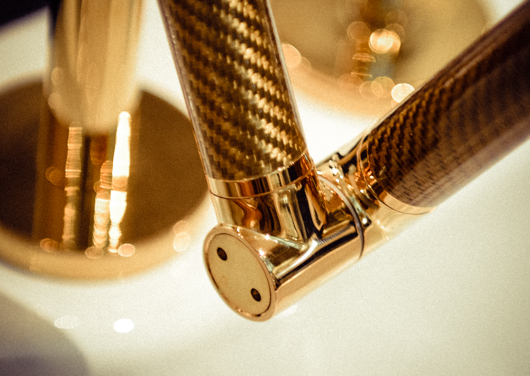 Below - Seemingly, authenticity is redefined in this new collection by Giovanni Barbieri. It immediately reminds me of this post on antique floors from Spain I wrote for thekitchn. 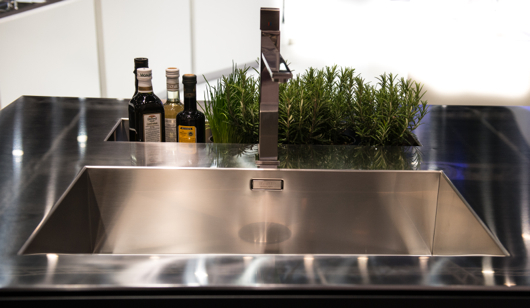 Below - A NEW product to the kitchen world, the introduction of a glass kitchen sink by JSG Oceana. I've got to take a look at this, especially to touch it, feel it, see it in action. It is said not to scratch or stain. Made in USA! 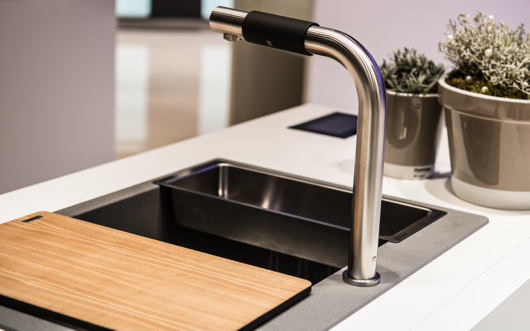 Below - Hafele, an incredible company with some of the most innovative products for kitchen and bath, introduces the LOOX LED System. 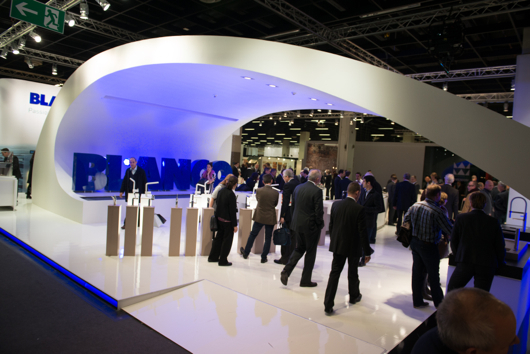 Think "plug and play", think "easy" solutions where multiple products work together for lighting design flexibility. I KNOW lighting information often begets a groan...in this case, all you have to do is to look for color coded products which all work together. I am so ready for Vegas!!!! So much more to come!